Elementary teacher at Roosevelt/Washington/Jefferson Schools in North Arlington, NJ. Choose a student to model for the class. Stand the student model on a desk in front of the classroom. Draw a contour drawing of the model. The drawing should touch the top and bottom of the paper. Outline the contour drawing with black marker. Draw a line separating the floor and the wall with the black marker. Add patterns to the figure drawing, the floor and the wall with the black marker. Color each pattern in two colors using watercolor markers. Choose contrasting colors for the figure, foreground and background. Display Purple Robe by Henri Matisse. Discuss the repetition of a color throughout the picture. Show how the color repetition makes your eye follow that color through the picture. Discuss the patterns used in the various areas of the picture: foreground, background, dress, robe, and vase. Point out how Matisse used only two colors for each pattern. Henri Matisse, The Purple Robe. Click on the image for larger size. This is a culminating activity for a figure drawing unit. The children have already created gesture and contour drawings. They enjoy taking turns modeling for the class. The results can be exceptional. 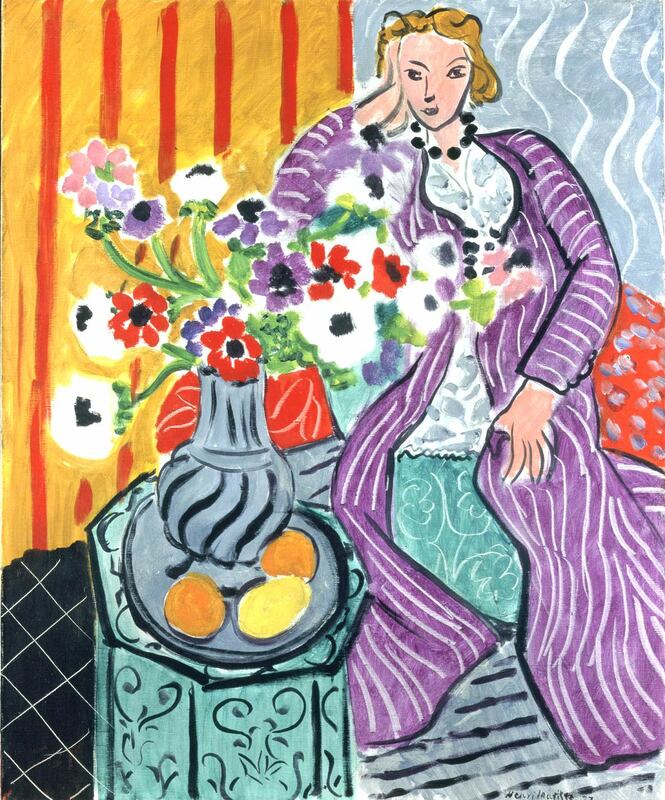 Henri Matisse- Web Museum's site. 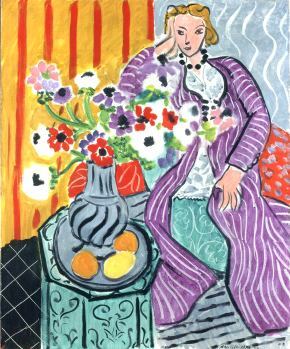 Henri Matisse Gallery- Visit Olga's gallery of his work.